New friends in ag, gifts in the mail, and fun beauty products to try? Count me in! I was paired up with Kelsey Pope, a fellow Nebraska girl. Unfortunately, Kelsey is a K-State grad and diehard Wildcat fan, but she knows some of my friends from high school, so we’ll let it slide. It was fun to get to know Kelsey this spring, as we traded work-from-home stories and our thoughts on our current beauty routines. And, she sent me great stuff to try. I told her how much I love travel-sized goodies since we’re on the road so much, and she delivered. The Jergens Natural Glow will definitely come in handy this summer – pale girl alert! The natural cuticle oil was homemade by a friend of hers, and Burt’s Bees is just the best, really. Thanks for the gifts, Kelsey! 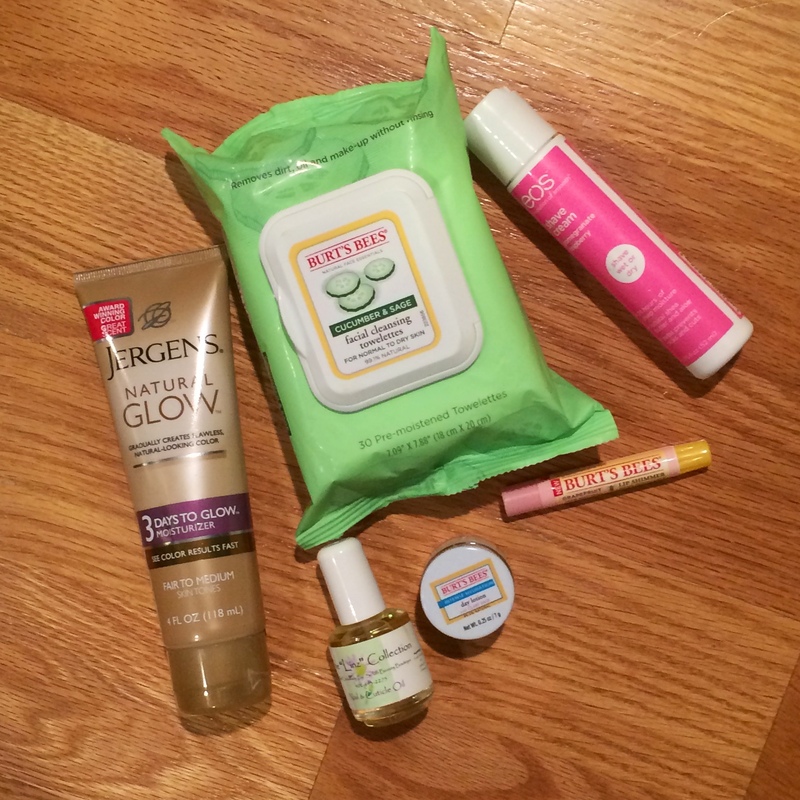 It’s SO fun to go shopping for these beauty swaps, and I love picking out products for my new friends to try. And thanks to Crystal for hosting these fun swaps – follow @crystalcattle on Twitter to learn more about the next beauty swap. This entry was posted in Uncategorized on 05.02.14 by awastell. I just bought some of the EOS shaving cream. So far I really like it. I am totally in that pale girl category. I am going to stick up for Kelsey bleeding purple. Go K-State! Fun stuff!! I have to second the EOS shaving cream! LOVE it! And you can’t go wrong with Burts!